Former Tamil Nadu Chief Minister M Karunanidhi's wife Dayalu Ammal on Tuesday moved the Delhi high court against the trial court order, which had dismissed her plea for exemption from appearing as a prosecution witness in the 2G case. Challenging the trial court's May 31 order, 82-year-old Ammal in her plea sought that the court pass an order for constitution of a medical board which would then furnish a report on her fitness to appear in the court. Appearing for Ammal before justice Veena Birbal, senior advocate Sudhir Nandrajog submitted she was diagnosed with cognitive and behavioural abnormalities in June last year and that she is progressively and gradually losing recognition of even her near and dear ones. Nandrajog also argued that due to her physical and mental condition, Ammal is prone to "abrasive behaviour, clumsy habit with sudden hitting or punching people, inappropriate talk and action and inability to take care of day-to-day activities". The lawyer also claimed to have a medical report of a central government hospital to support his submissions. He further submitted that the bench should seek a report from the medical board and if it gives a fitness report, his client has no objection in appearing as witness before the trial court. To this submission, the court observed, "Why can't you get yourself (Ammal) examined from a government hospital and produce a report before the court. This is to stall the proceedings." "You appear before the trial court. In case you don't understand the questionnaires of the court, then make a submission before the trial court for such an order," the bench said. Justice Birbal deferred the plea till tomorrow and asked the counsel to argue on the aspect of its maintainability after CBI's counsel Sonia Mathur submitted that the Supreme Court has already put a blanket ban on the high court to entertain any plea in the 2G case. The court asked the CBI to explain it under what circumstances and in which plea of CBI the apex court had passed this order. During the course of arguments, CBI's counsel questioned the maintainability of Ammal's plea and referred to the apex court's April 2011 order and November 2012 order clarifying its previous order in this regard. The trial court had on May 31 dismissed Ammal's exemption plea, saying she is an "important witness" as she was a director in Kalaignar TV Pvt Ltd in which an alleged bribe amount of Rs 200 crore was received. Ammal had approached the trial court seeking exemption from personal appearance as a witness and to dispense with her presence in the case citing her ailments. The trial court's order assumed significance as Karunanidhi's daughter and DMK MP Kanimozhi and Sharad Kumar, Managing Director of the TV channel, is facing trial in the case along with former Telecom Minister A Raja, DB Realty Ltd MD Vinod Goenka and others. It had also said her her medical record does not indicate that she is "mentally or physically incapacitated to such an extent or that she has lost her mental cognitive power that she cannot understand questions and give rational replies". The CBI has, in its charge sheet, discussed the routing of over Rs 200 crore illegal gratification from M/S Dynamix Realty to Kalaignar TV Pvt Ltd through M/S Kusegaon Fruits and Vegetables Pvt Ltd and Cineyug Films Pvt Ltd. In its first charge sheet filed on April 2, 2011, CBI had said the money had travelled through a "circuitous route" through Kusegaon Fruits and Vegetables Pvt Ltd, a DB group company and Cineyug Films Pvt Ltd, to Kalaignar TV in which Dayalu \ Ammal, Kanimozhi and Sharad Kumar were having 60, 20 and 20 per cent shares respectively. 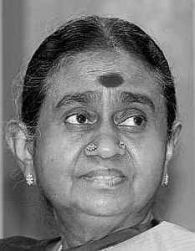 Ammal was not named as an accused in the case by CBI which had said due to her advanced age and "non-understanding" of any language other than Tamil, she was only fulfilling the legal requirements of Kalaignar TV Pvt Ltd in which she is one of the Directors. CBI had said Ammal had delegated her power to Sharad Kumar to run the company's affairs.